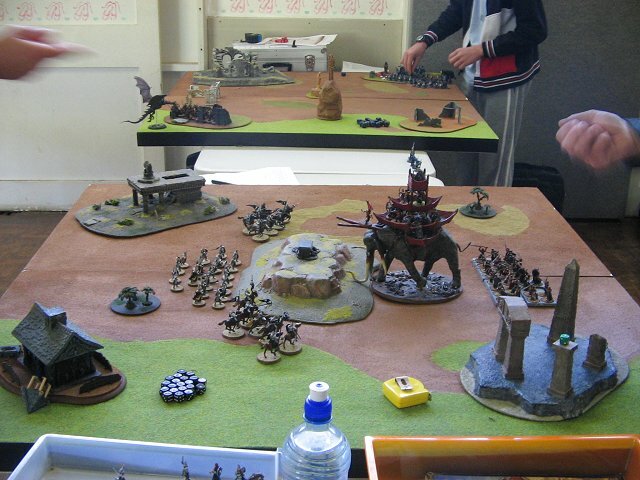 The Lord of the Rings Strategy Battle Game (abbreviated as LotR SBG), often referred to by players as Lord of the Rings, is a tabletop miniature wargame produced by Games Workshop (GW). It is based on The Lord of the Rings film trilogy directed by Peter Jackson, and the book that inspired it, written by J. R. R. Tolkien. It was initially released in 2001 to tie in with the movie The Fellowship of the Ring. New box sets with updated rules were also released for The Two Towers and The Return of the King movies. Later Games Workshop also began to add content that was featured in the original book but not in the film adaptations (e.g. Tom Bombadil, Radagast and Glorfindel), first with the Shadow and Flame supplement, and most recently with the Mordor supplement. This was generally supported, but there were mixed reactions when Games Workshop invented characters and wrote histories for lands Tolkien wrote little about, such as Harad and Khand. 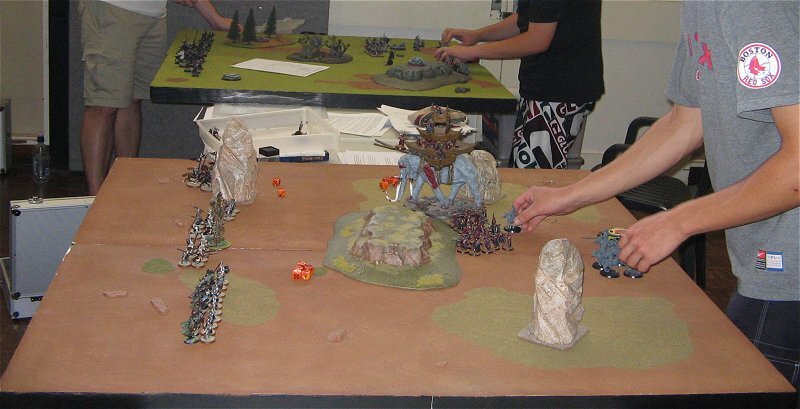 Games Workshop released a complete new edition of the rules in September 2005, entitled The One Rulebook to Rule them All, and a compact edition entitled The Mines of Moria. However, these were subjected to scrutiny because some profiles were omitted. 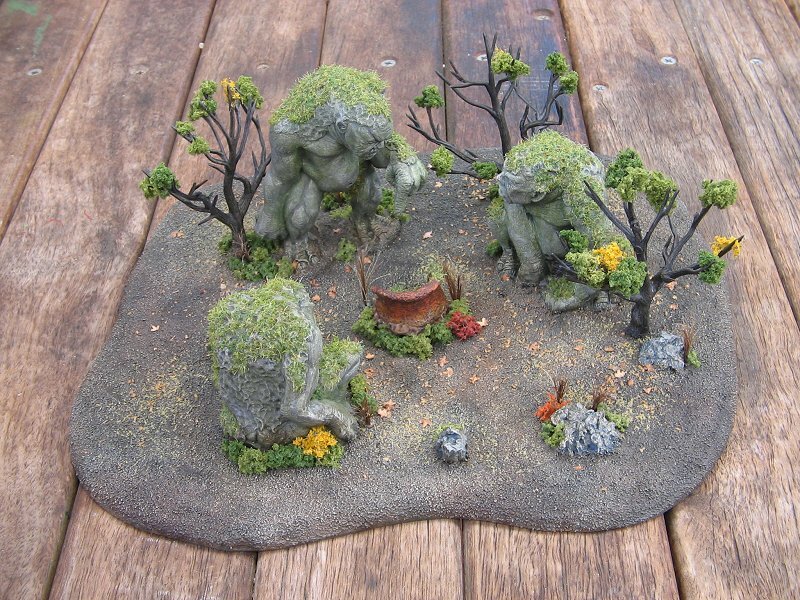 Here are some of my Lord of the Rings terrain pieces and forces. There will also be some battle reports of the game. The following is a report of a battle that we played a while back. It is written by a mate, one of the other players in the game. I’ve included it here to help show how the game works and how terrain makes the game come alive. 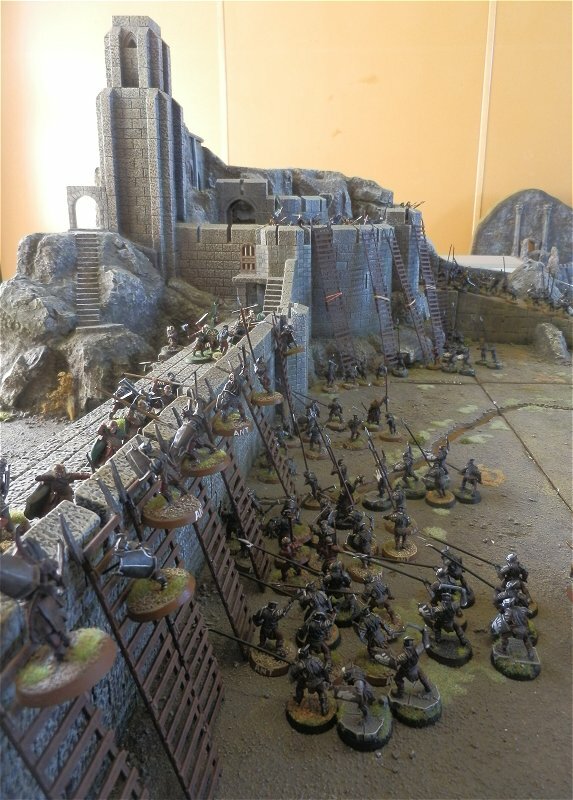 April 13th 2014 4 of us gathered at our local games club Tabletop Gamers Association, to to and play a Helm’s Deep game based more on the book events than the (wonderful) movie by Peter Jackson. 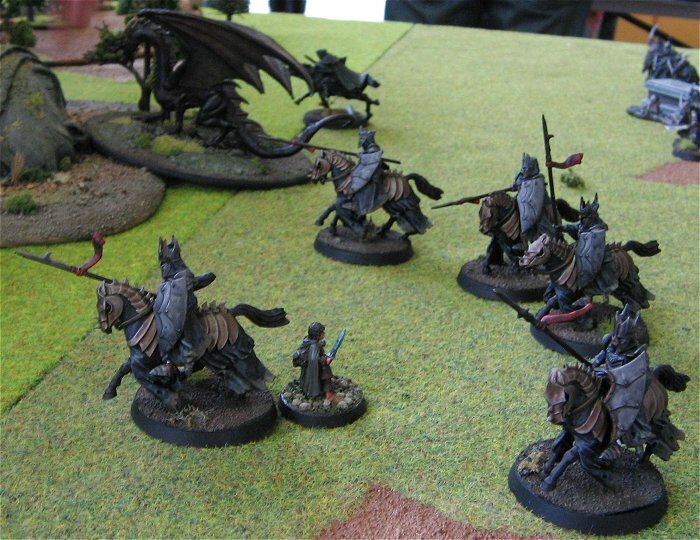 Our only real compromise was to base the relief force, lead by Gandalf and Erkenbrand on Horse rather than on foot. There were still a few more Isengard companies to be deployed when I took this photo. 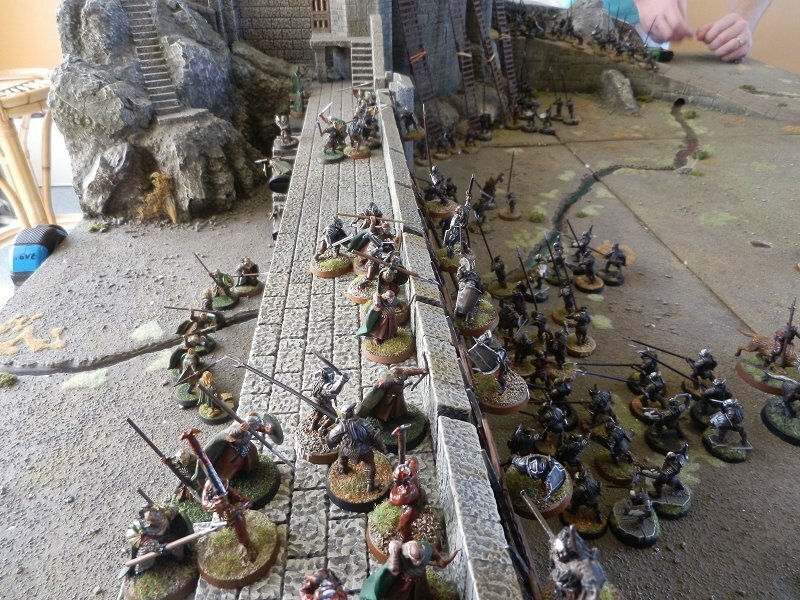 The assault on the gate contained many captains, a bomb team and a battering ram. 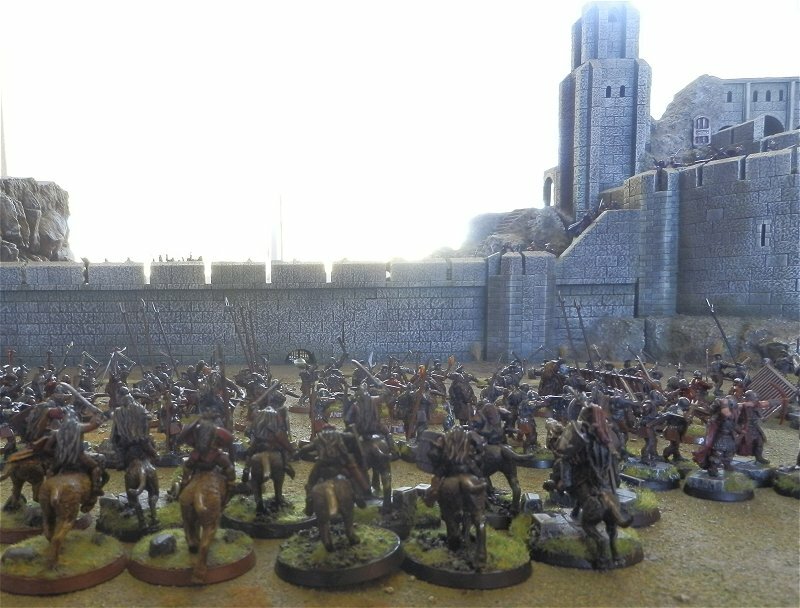 The assault on the Deeping Wall had 10 ladders, 2 bomb teams, Berserkers, Captains, dozens of Uruk Crossbows, Warg riders (to help defend from the relief force attack) and even a few Dunlendings. The gate was to be held by Aragorn and Eomer along with support from above. The Wall was always going to be hard to defend and once the Uruks made a gap in the Rohirrim lines, they poured over the Wall. About half way through the game, things looked like this. Aragorn and a few Royal Guard still held the gate (Eomer had died). Ladders were raised along every part of the fortress. The Siege Bow had just about destroyed the gate. The bombs were in place at the culvert whilst Berserkers and Uruk captains were on top of the wall. 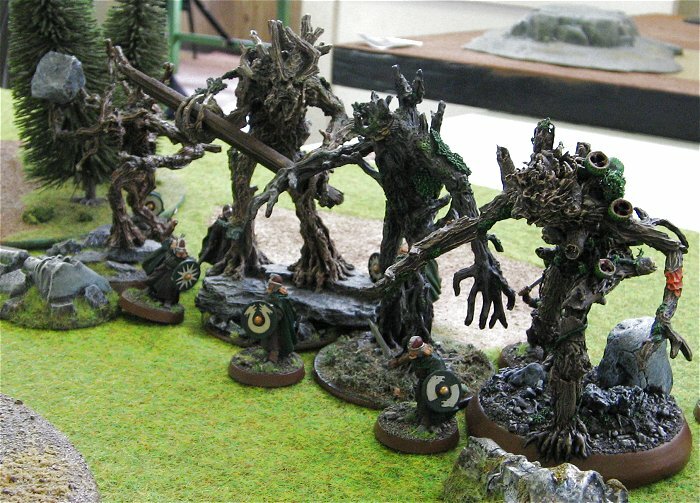 The Isengard army split up and prepared to defend itself from the relief force due any moment. Finally, the bombs were detonated under the wall. This killed Legolas and several other warriors from both armies. The bomb was also ignited on the causeway in front of the gate (right at Aragorn’s feet). Aragorn was the only combatant to survive the blast. More Uruk troops advanced upon the gate and severely wounded Aragorn. The relief force arrives and rides straight into fierce battle. Several turns later, the relief force is wiped out but it also managed to destroy most of the Isengard troops that were sent against it. 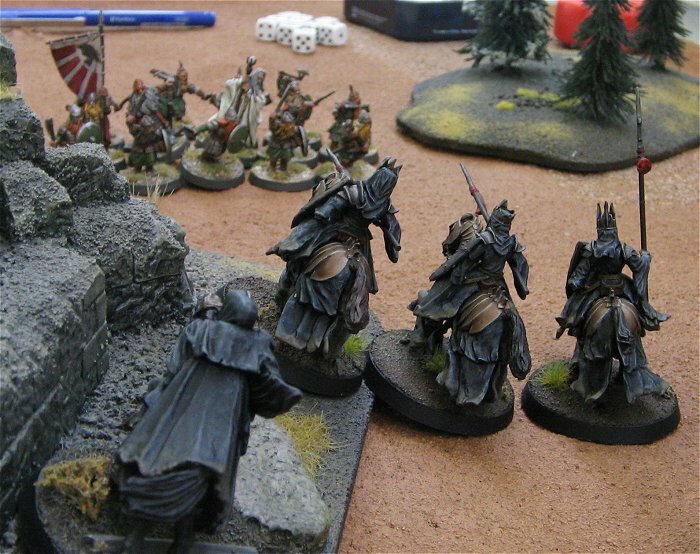 This lead to the Isengard army becoming broken which played a large part in the outcome of the game. The gate is broken but Theoden, Gamling, Aragorn and a few Royal Guard manage to keep the enemy from entering the fortress. 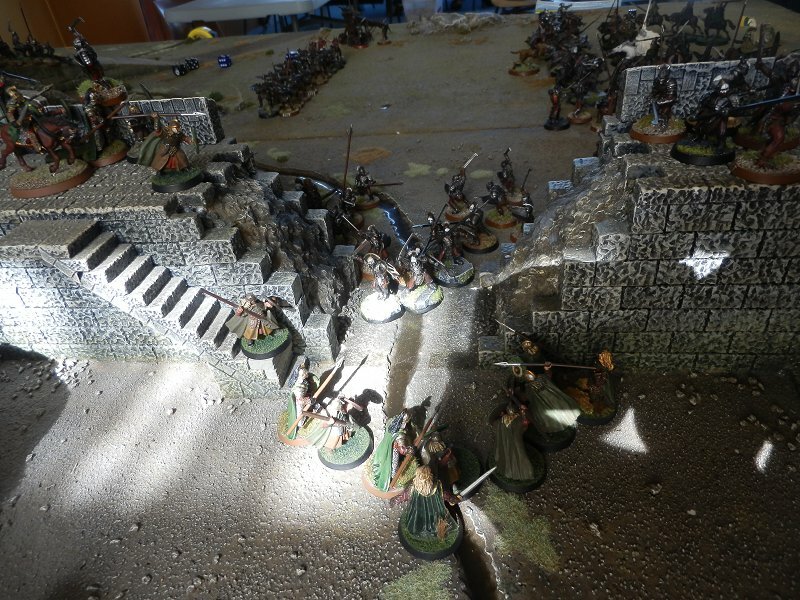 The defence at the wall has become a delaying action which sees Gimli, Grimbold and Hama fall. 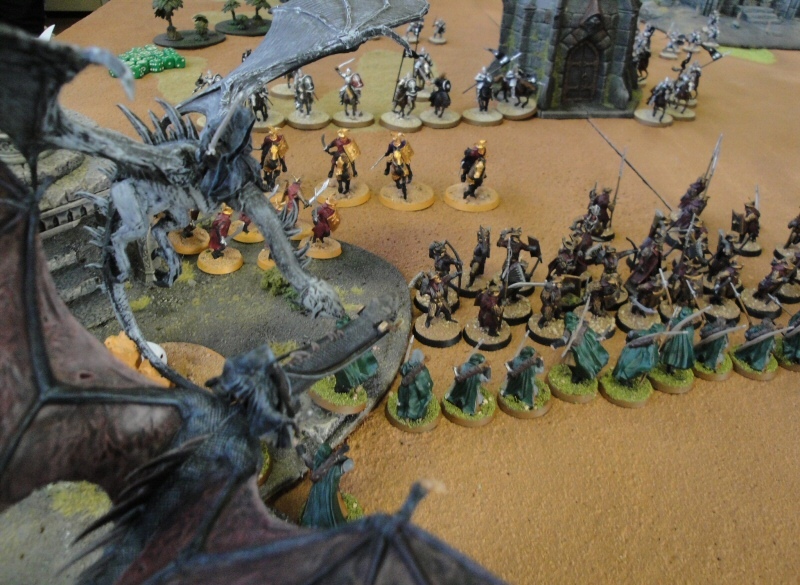 As the Isengard army was reduced to 25% of it’s starting number, the game came to an end and the victory conditions were checked. 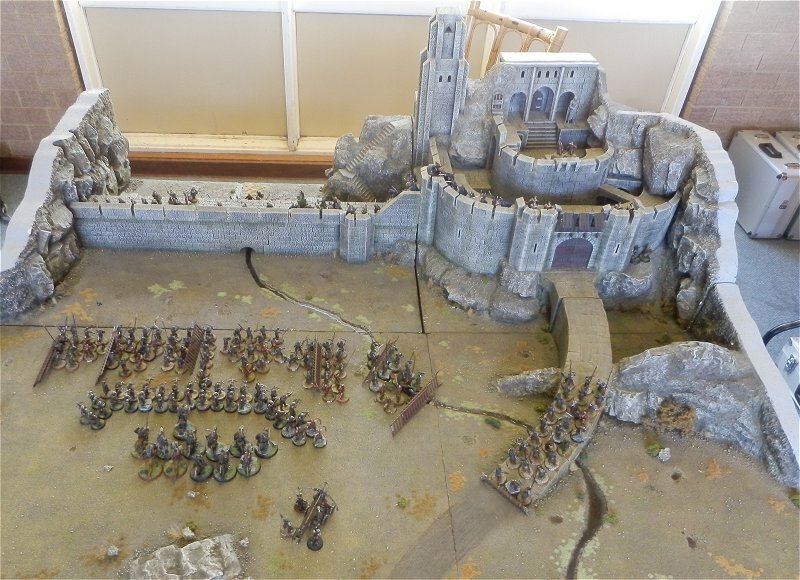 The Uruk army had breached the Deeping Wall and scored many points there but the valiant defence of the gate had held the attackers out of the Fortress and this lead to a narrow Rohan win! 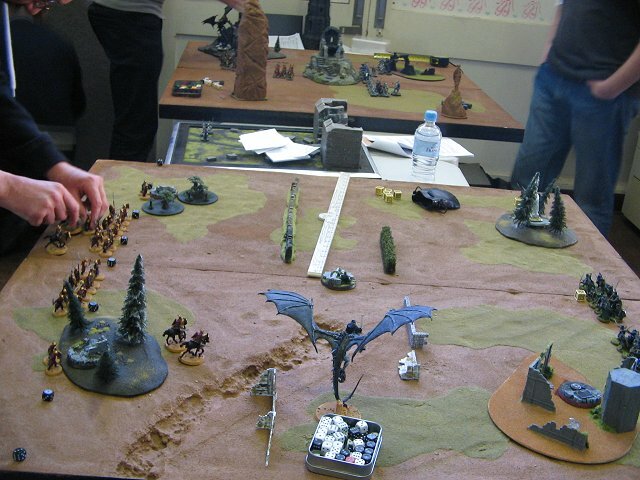 We had a LotR SBG tournament here in Perth, Western Australia on the weekend (9th Oct 2011). It was great fun with a few nice twists to make things interesting. Here’s a report of my 3 games. Dragon with Tough hide and wings. 34 models with 8 Might. A fantastic day and I’m really happy to walk away with Best General trophy and second overall to Mike (by only 1 point). Clash of Champions… or to give it another name – bring a dragon and pretty much win! I say that but it was a VERY close game in the end. Nick played very well and I felt pretty dirty for keeping the bulk of my force away from the powerful Dwarf hero Dain and Saruman. 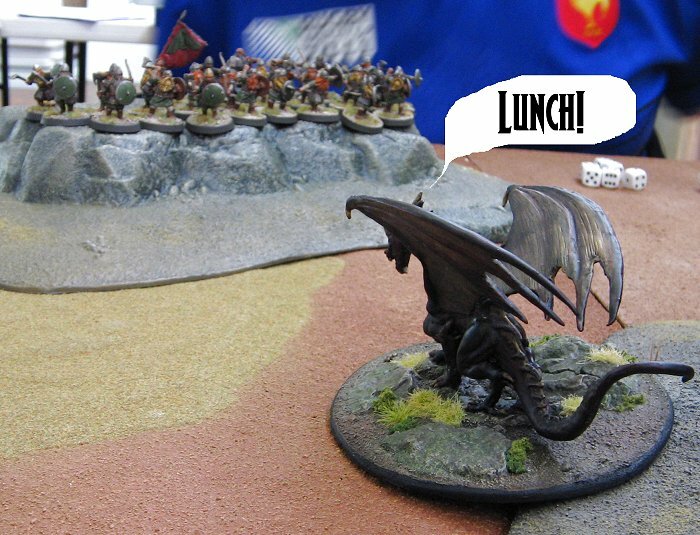 My plan was to send the Dragon against the Dwarf infantry/archers, whilst my Nazgul sapped all of Saruman’s Will. It worked but of course, Saruman still had his staff and that gave hime a Sorcerous blast each turn which slowly racked up the kills. The Dragon wasn’t as effective as it might have been. High defence dwarves in defensible position robbed the dragon of it’s charge bonuses but It still killed 13 Dwarves (including Balin). 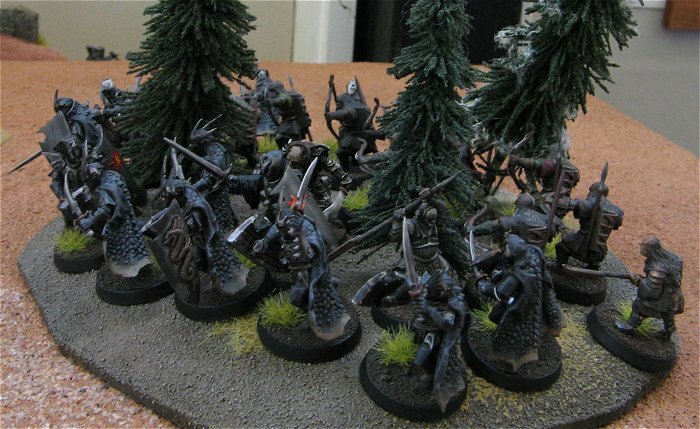 Once the Ringwraith was down to 1 Will point, I kept it close to my Black Numernorean infantry to make it harder for the Dwarves to charge into me. This tactic worked well all day and saved my beacon a few times! In the end, the Dragon had 13 kills (a few more than Dain and Saruman) but I was only 1 model off breaking (which would’ve given Nick a few extra bonus points). I was drawn against Daemon’s amazing Ent/Rohirrim army. Daemon’s army was small but very powerful. The Ents set up across the center in a tight formation whilst the Rohirrim cavalry set up on their left flank. The right flank was open and I saw my opportunity. I set the Dragon, Ringwraith and Morgul Knights in the center to head for the Hobbit. 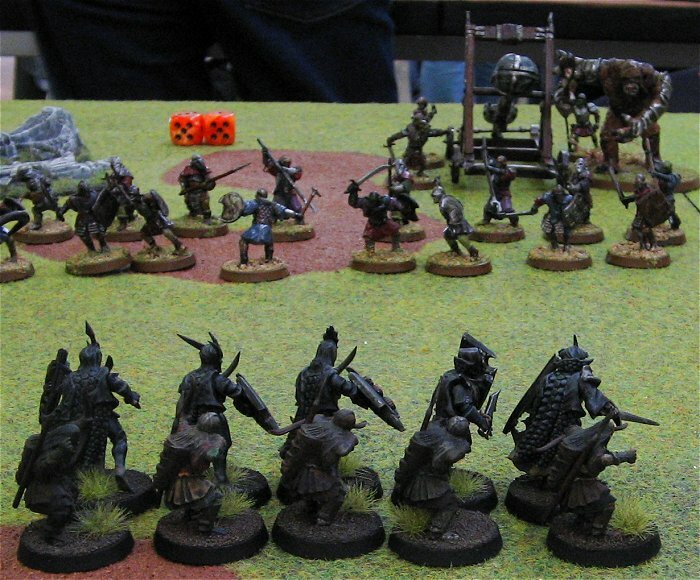 I set up the bulk of my Black Nemenoreans and all my Orc archers to face the Rohan cavalry. A small token force of 3 Black Numenoreans and 4 Orcs with spears was on my left flank. I was quite paranoid about the Ents throwing stones so in a rash decision, I charged my Dragon into 2 Ents. A third Ent joined in the fight and it looked like the Dragon charge was not to last long. 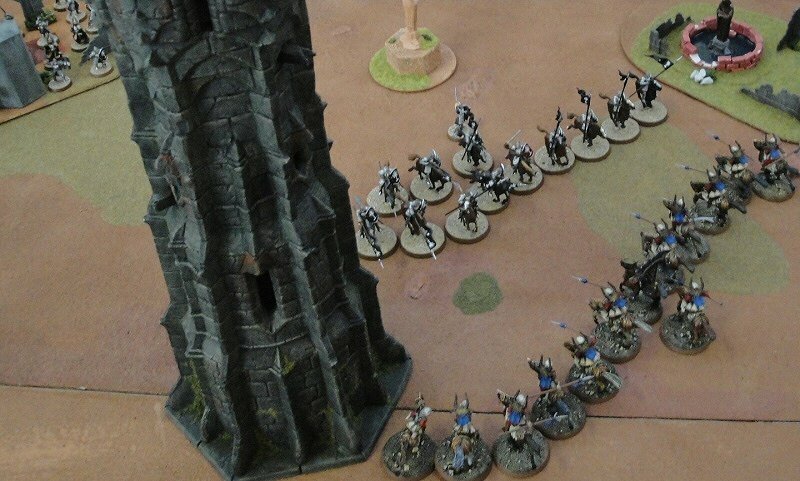 Meanwhile, my Morgul Knights grabbed the Hobbit and headed for the empty left flank. The remaining Ent headed that way but the Nazgul kept it Transfixed for most of the game. On the other side of the board, my Orc archery was on fire and managed to kill a few horses and riders before the Rohirrim charged. Again, failed terror tests hurt my opponent and my Black Numenoreans (with orc spear support) managed to bring most of them down. 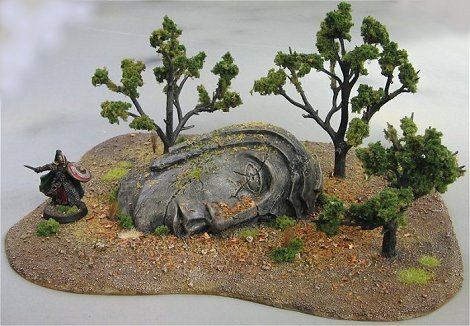 All this time, the dragon was getting thrashed by the Ents (and one brave warrior of Rohan). For 5 turns, I charged the dragon into the fearsome Ents. Every turn it lost the fight but it’s high armour value, 3 points of Will and the extra point of Might I picked up from the first game kept it on the field. 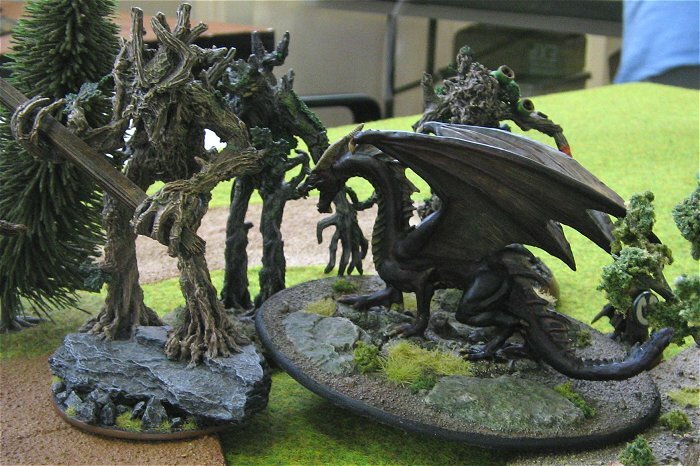 With one wound left on the Dragon and the Morgul Knight carrying the Hobbit, two moves away from victory, The Dragon charged the 3 Ents again. The Nazgul only had one point of Will left so it was unable to Transix the remaining Ent. A brave Morgul Knight charged the Ent and tied it up for the turn (getting ripped apart in the process). The Dragon lost this round of fighting and it finally fell under the fury of the Ents. 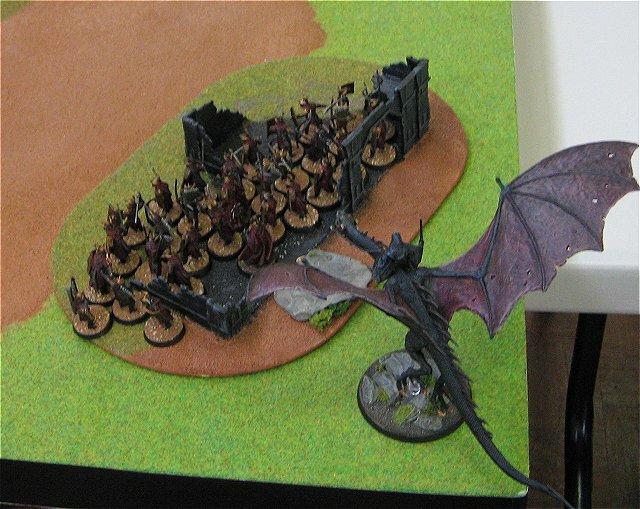 The dragon’s actions had bought me the time I needed and with 1 point of Might left on the Nazgul (for a heroic move if needed), I was guaranteed of victory. The loss of the Dragon (my armies leader) affected the victory conditions. MVP – I want to say the Dragon but really it has to go to the Orc Hornblower. Without his Courage boost, the Dragon would’ve failed many courage tests and not been able to tie up the Ents. Hornblower = best 20pts spent for an Evil army! Minas Morgul vs the Black Gate. 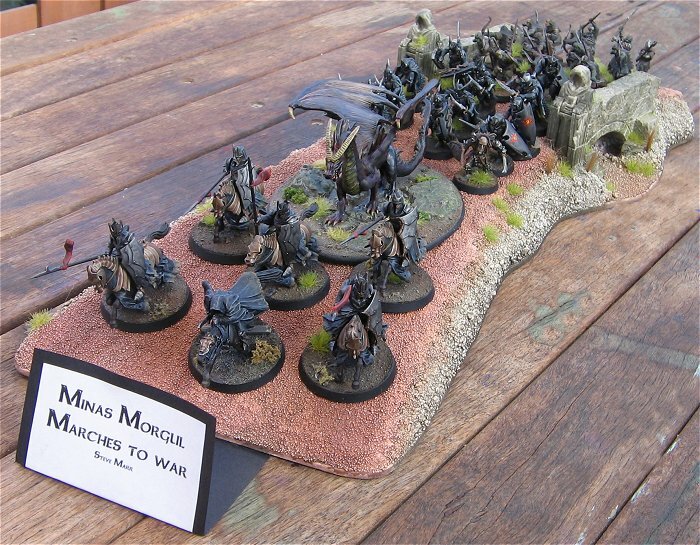 Mark’s army had 2 named Nazgul, 2 Mordor Trolls (one being a Chieftan), a catapult (never faced one of those before), Morgul Knights and some Orc infantry. The deployment conditions actually helped me a lot here as we started so close together I could get inside the catapults minimum range quite quickly. After deployment, my plan was simple. My infantry had to beat Mark’s Orcs (to break his army) whilst my Dragon, Ringwraith and Morgul Knights had to beat The Dark Marshal, The Shadowlord, A Troll Chieftan and some Morgul Knights. 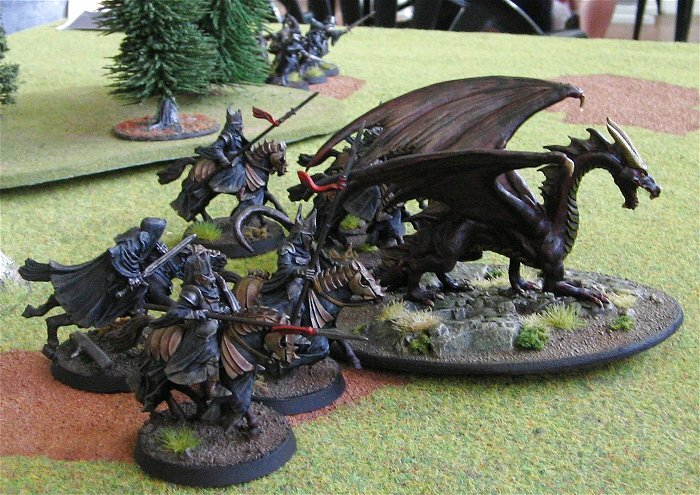 Magic was the Dragon’s main weakness and 2 named Nazgul were going to be tough. First turn and Mark attempts to Transfix the Dragon which it resists. Next action is to try and drain the Dragon’s courage which it also resists… excellent news for me! 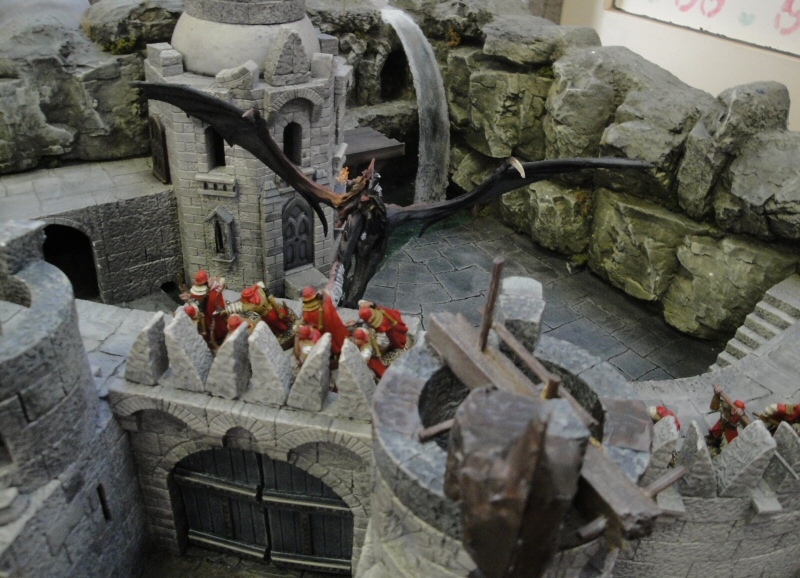 The Dragon charges into the Dark Marshal and kills him in one round of fighting. My Ringwraith attempts to Sap Will on The Shadowlord but the spell is resisted. 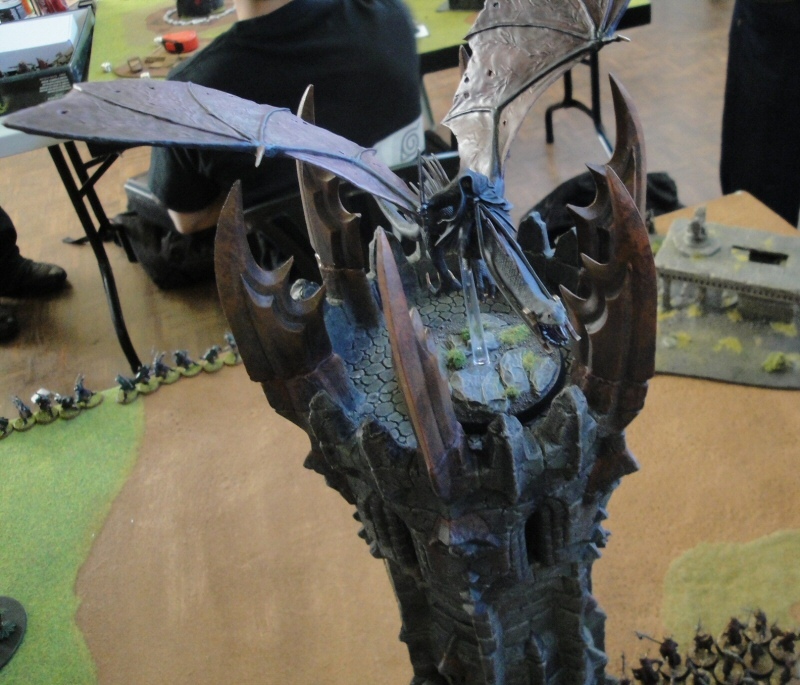 Mark’s catapult hits my Morgul Knights and kills 3 of them in one shot… wow! That was the high point for the catapult as I got inside it’s minimum range and took it out of the game. The Dragon (which now had 5 Might points thanks to Matt’s skill development table) was charged by the Troll Chieftan (which had to use all it’s Might to pass it’s Courage test – D’oh! ). 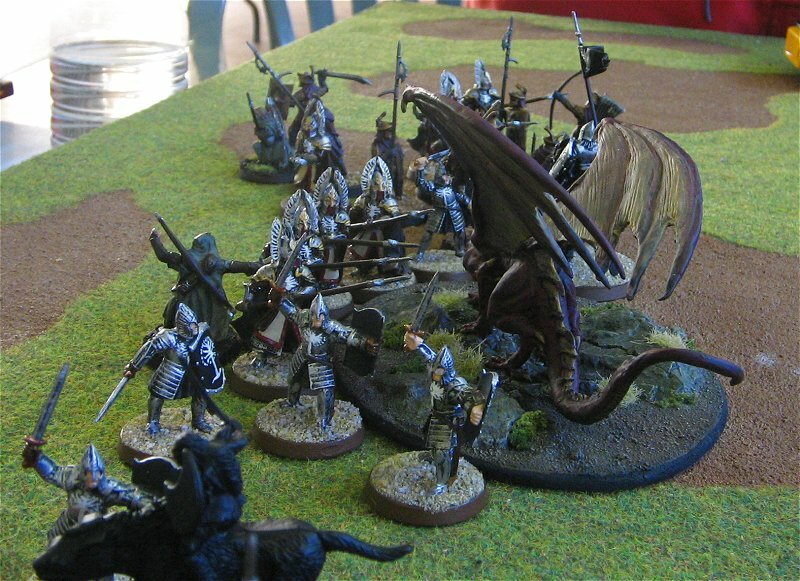 Mark’s cavalry tried to charge the Dragon but several failed Courage tests really hampered them. My Ringwraith Transixed the Troll Chieftan and the Dragon finally ripped it apart. 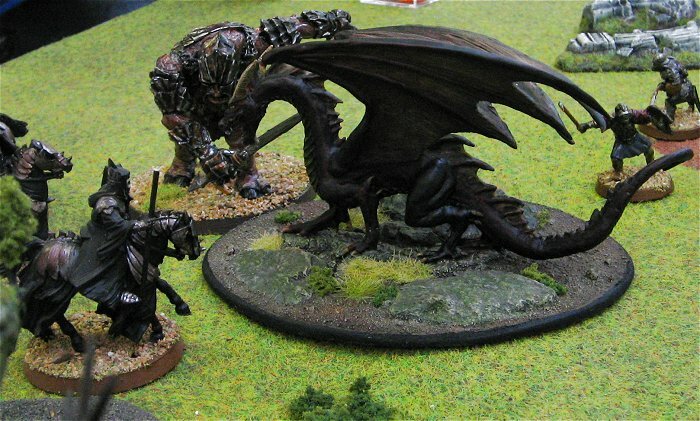 Mark’s Shadowlord tried to Transfix the Dragon twice but the mighty beast resisted both spell attempts (needing a six to do it each time on 1 dice! ). My Black Numenoreans (with Orc spear support) charge Mark’s Orcs and slowly set about wiping them out. Even when a Mordor Troll joined the infantry fight, it failed courage tests which left it to watch on in fear. 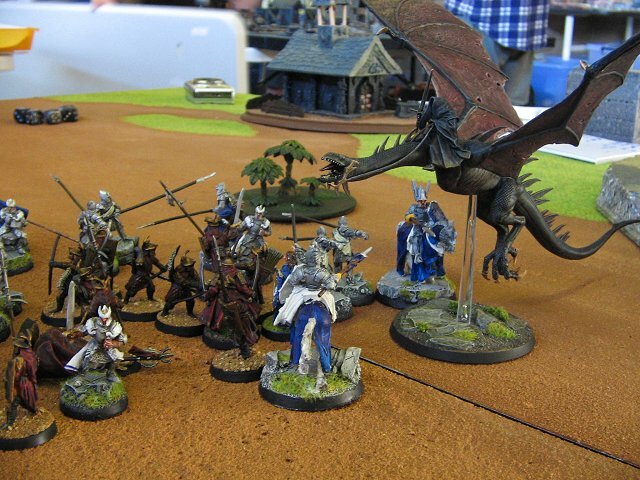 The Dragon charged into the Shadowlord and after a few rounds of combat, killed the Nazgul. With his army broken and a few more failed courage tests, it was a fairly simple mop up of the final 3 Orcs. 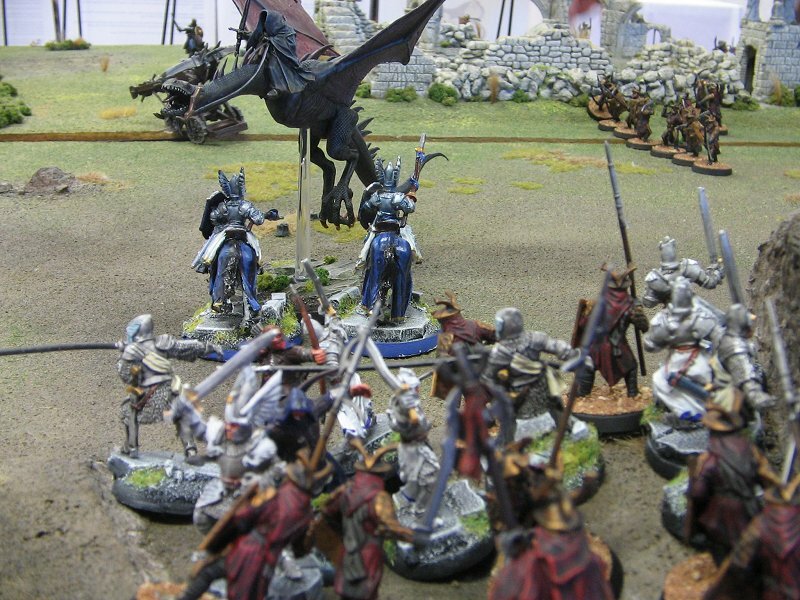 MVP – Really has to be the Dragon for it’s sheer destructive influence (although my armies Terror causing abilities was a BIG contributer to the win). 3 great game and 3 wins. A most successful day for the army of Minas Morgul. Thanks again to Matt for orgainising things and to Nick, Daemon and Mark for outstanding games. This battle saw a massive 6 army, two-board all-day battle take place as the forces of Isengard marched on the Rohan stronghold of Helms Deep. 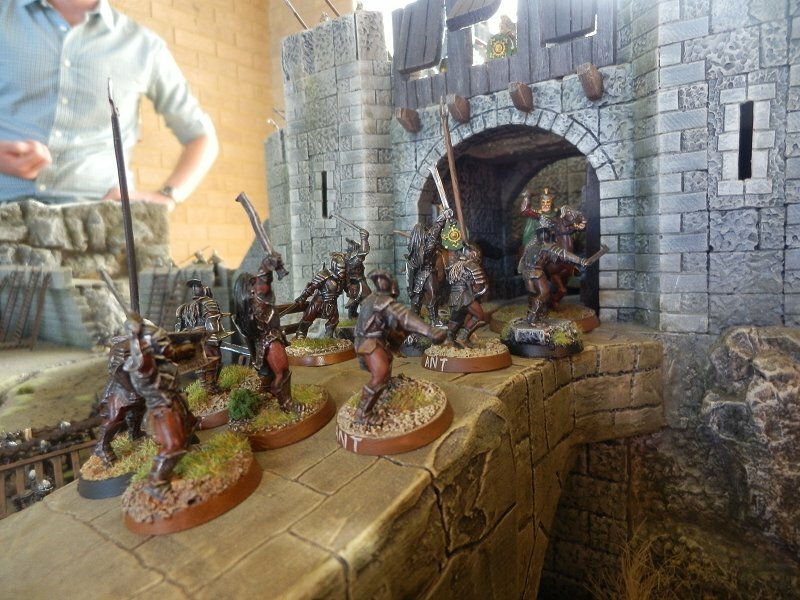 The rules used were a highly customised mixture of Helms Deep and Pelennor Fields that I wrote and then modified to suit six players. The beautiful playing boards were made by Onyx, so as always its like fighting a war across photo-realistic art. 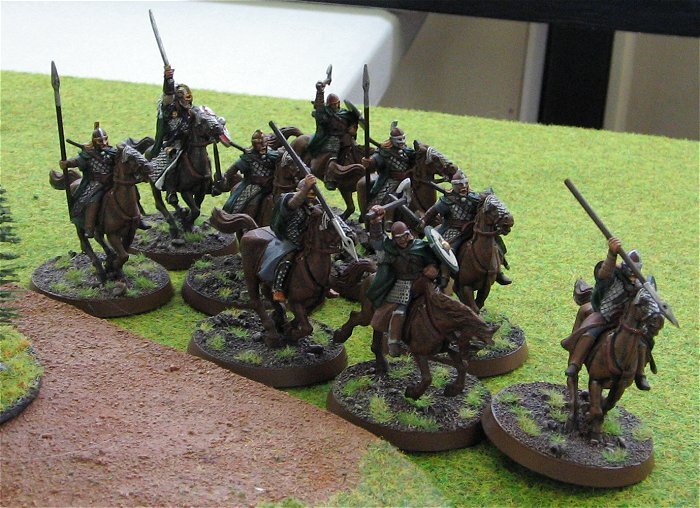 The good armies were Rohan Defenders under Theoden, Elven Allies lead by Legolas and a relief force of Dol Amroth, cavalry (taking the role usually held by the Rohirrum) that started on a separate board and had to fight its way to the main conflict. The evil armies featured an Isengard Siege force with Ballistae, ladders and explosive mines and the fighting Uruk-Hai of Legions of the White Hand. On board two were the warg-riders of the Isengard Raiders trying to decimate or at least slow down the reinforcement cavalry. Grima: Even if it is breached, it would take a number beyond reckoning, thousands to storm the keep. Grima: But, my lord, there is no such force. The voices of the Uruk-Hai thunder forth and shake the earth: Durbgu nazgshu, Durbgu dashshu! Durbgu nazgshu, Durbgu dashshu! On the command to attack Berserkers and Uruk-hai grabbed their ladders and began the sprint across the open plain towards the defences. 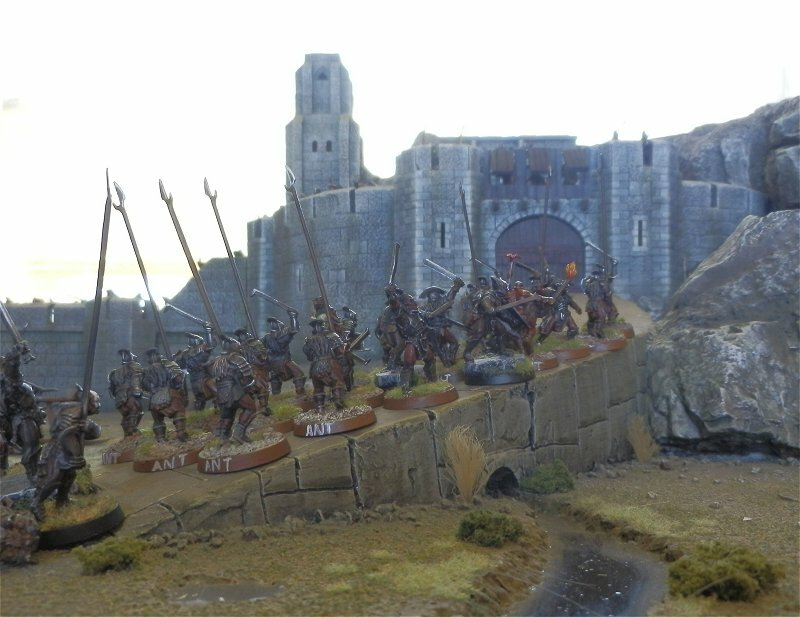 The siege Ballista was positioned to rain mechanical death on the walls and fortress gate and began firing relentlessly, but it was the Elves who claimed first blood, volleying slender arrows into the approaching mass. Meanwhile, the cavalry moved forward towards a wall of approaching Warg Riders, arrows glancing off their heavy armour but brining down one of their horses. The knight fell to the ground only to land on his feet and leap up ready for combat with sword drawn. 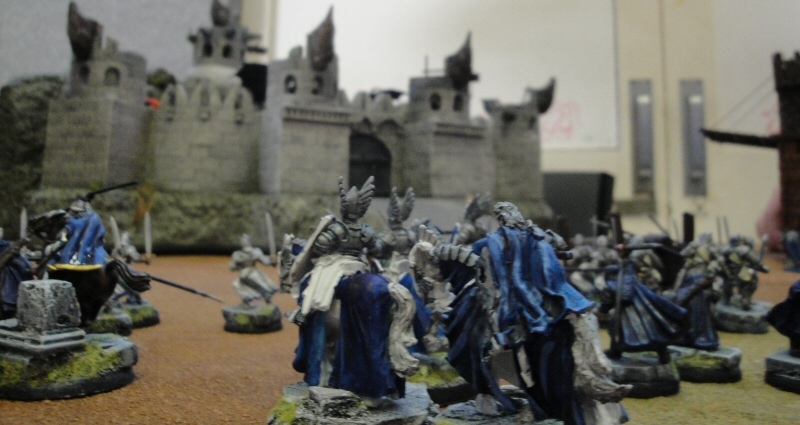 On Prince Imrahil’s command, the knights of Dol Amroth lowered their lances and charged forward, splitting the warg line in two and bringing down 4 wargriders instantly. The uruk-hai approached, suffering heavy casualties from both Elf and Rohan bow, but their crossbow men now were in position to fire back. The bolts that did not glance off the fortress exacted a toll of rohan lives, bringing a cheer from the evil warriors. Ugluk, holding high an orc head, whipped his men on and they raced up the narrow slope to the gates of helms deep. Almost all would fall, but they would rather face the bows of the enemy than the wrath of their leader. Ugluk: Looks like meat’s back on the menu boys! By the time the ram reached the gate, the cavalry had completely destroyed the warg raiders and killed their leader Sharku. Rohan let out a cheer – The reinforcements had arrived! And even better, rather than go straight in to the comparative safety of Helms Deep the cavalry swept across the plain to fight back the ladder teams. Berserkers claimed the lives of two knights while another fell to crossbow bolts, but the uruks were lost and knights had the cunning plan to drag the ladders back behind the walls with them rather than leave them where they could be used again. The ram team were lost as murder holes opened above the gate and Rohan spears rained down, but Ugluk spurred two survivors to leap the gap to the postern gate which he would try to break down through brute force. One fell to his death in the jump, so the second required a swift kick to make the leap. SARUMAN: A new power is rising. It’s victory is at hand. This night the land will be stained with the blood of Rohan! 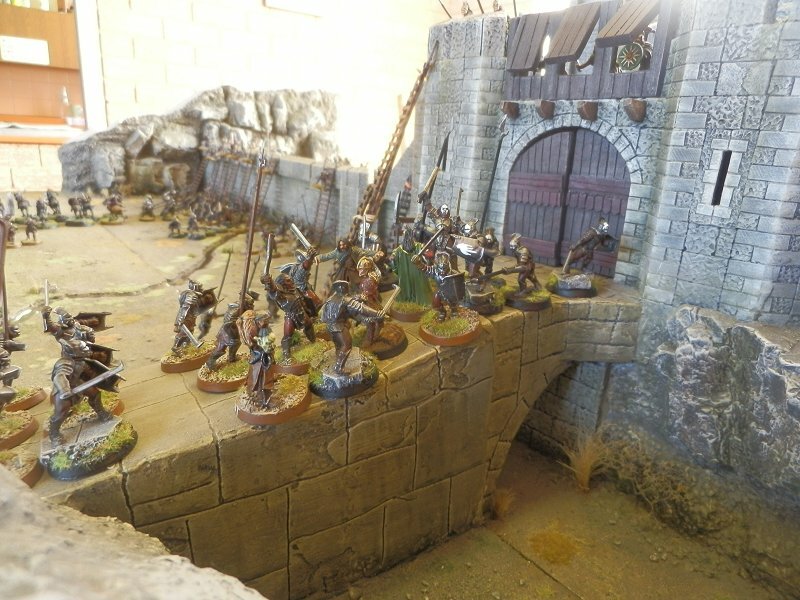 March to Helm’s Deep! Leave none alive! To war! There will be no dawn for Men. 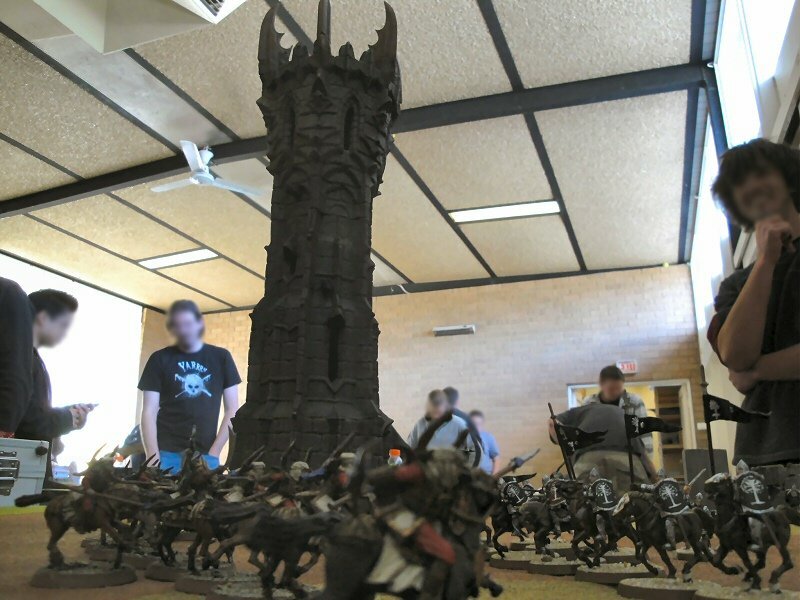 On news than reinforcements had arrived at Helms Deep, Saruman was moved with rage and he himself set out with a second force, larger and featuring powerful trolls of Isengard, foul bombs, engineers and another wave of uruk-hai. Their arrival was delayed by chance favouring the Good, but when they made it to the battle field the forces of evil were strengthened beyond reckoning. This time, the bomb teams struggled over the bodies of their fallen comrades and through the hail of arrows to make it almost to the wall, but to their horror the Dol Amroth cavalry rode out again, lead by King Theoden and Imrahil and engaged them before they could set the explosives up. Again, a berserker beat the odds and beat back a charge of several knights by himself, while an Isengard troll swung his weapon around and brought down two enemies. A bolt from the ballista was fired into the crowded warriors, only to miss the knights and instead hit the bomb as it lay on the ground! Killing a knight as it flew, the bomb was carried all the way to the wall by the impact but was not set off. It was soon over for these attackers, as the cavalry kept on until they were destroyed. Saruman attacks from Isengard. Sauron from Mordor. The fight will come to men on both fronts. 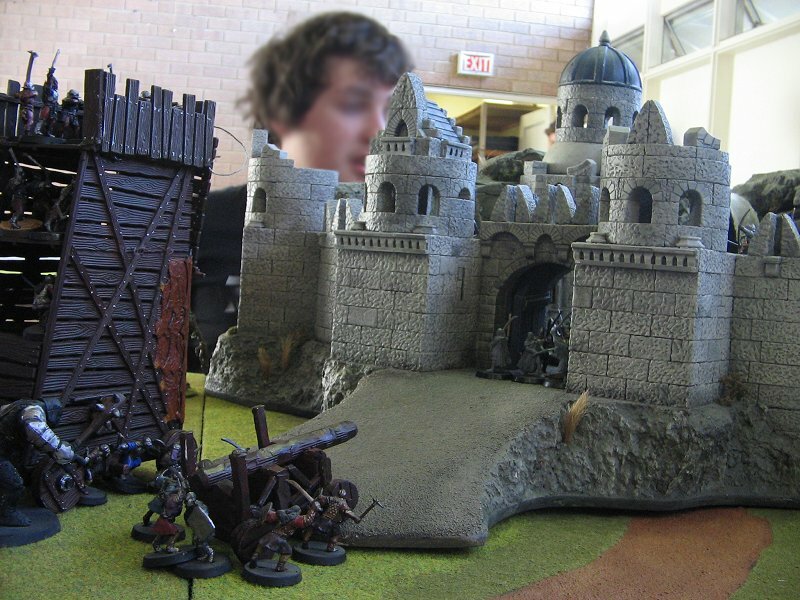 On the second front, the impact of several ballista bolt was enough to finally splinter the fortress gate and it was cleft in twain and thrown open – Helms Deep was breached! With a gutteral yell the Trolls and Uruk-Hai charged in, lead by Saruman himself. The air crackled with electricity as arcane power was cast from the White wizard’s staff, blasting and immobilising defenders. Gamling fell quickly, and Eowyn only barely managed to stay alive by cheating fate as the brutal combat claimed lives on both sides. The rohan defenders were well positioned however, and rained down arrows and spears from above as the fights began in the narrow confines of the fortress. The angered trolls brought down more defenders, but a heavy toll was exacted as elves, rohan and Pikemen of Dol Amroth all rushed to reinforce the gate. Several dying as they leapt from above with no regard for their own lives, rohan defenders managed to engage the terrifying wizard in combat, and as the last uruk-hai fell Saruman himself was taken. The siege was broken, and the brave survivors of Helms Deep greeted the light of a new dawn. Here are the rules we used – specifically designed for 6 people to each have a force, and with some (optional) minor victories to focus players on individual goals. Feel free to use/modify any parts you like. In particular, if your Helms Deep is anything near as defensively capable as the one Onyx built, you’re gonna need a bigger invasion force! 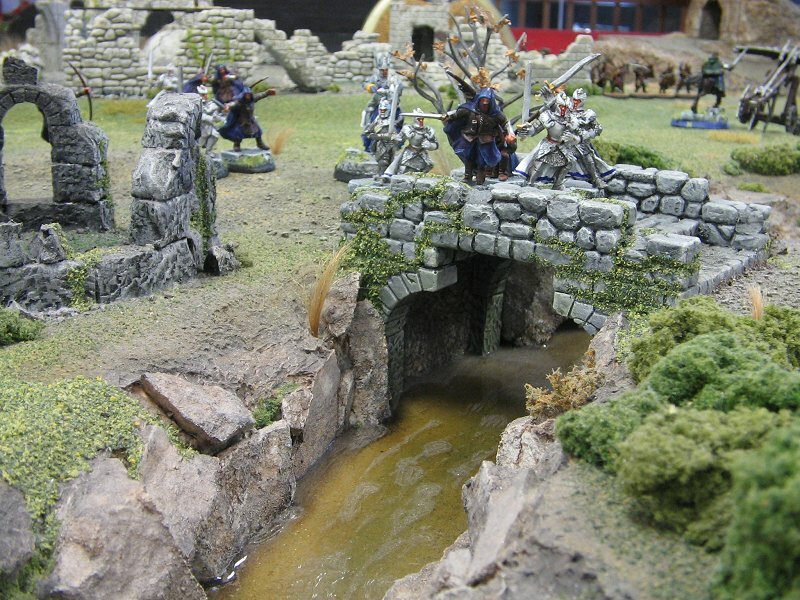 The Rohan Defenders and Elf Allies have time to prepare, and can deploy anywhere inside Helms Deep. 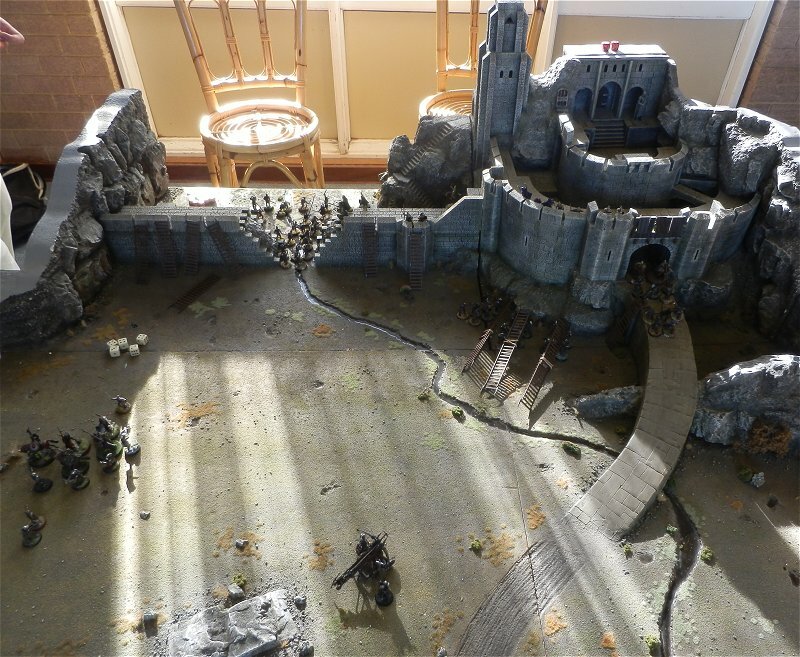 The Uruk Invaders and Uruk Siege deploy outside Helps Deep within 12′ of the far left corner. 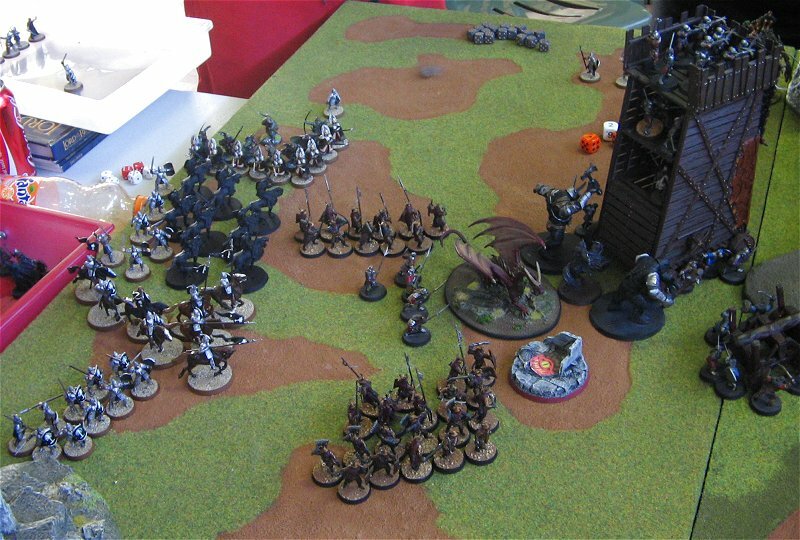 The Cavalry deploy on the furthest right end of the expansion board and fight a separate battle with The Raiders of Isengard until they make it to the main board. They should hurry to break-through to the main board before the gates are breached, while the Raiders must slow them and kill the riders if possible. 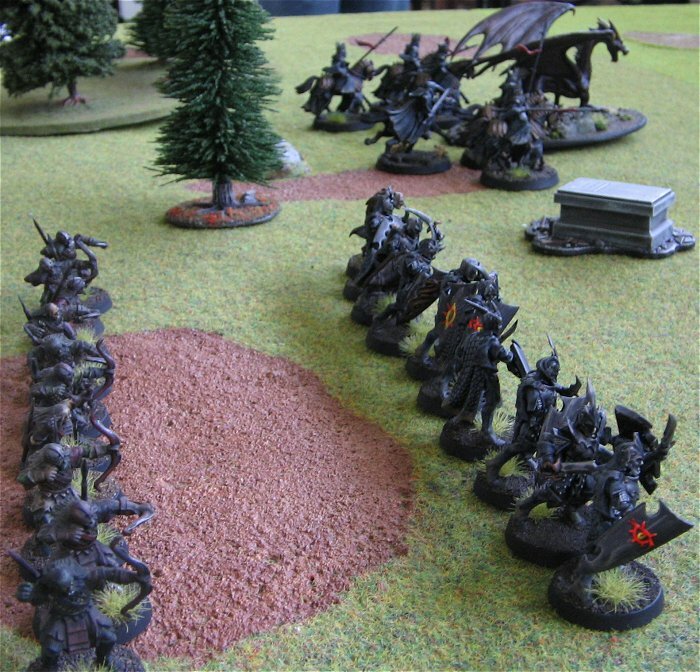 If the Cavalry make it to the main board, they may deploy anywhere within 6′ of the far edge. When news that the Cavalry has reached the main board of Helms Deep comes to Saruman, he himself will set out to bring an End to the Age of Man. On a roll of 5+ Saruman arrives with The White Hand reinforcements, Demolition teams and an Isengard Wrecking Crew including Trolls. They deploy on the far edge from the corner away from the Cavalry’s arrival. The game is played until one of the Major Victory conditions is reached. At that point, the points from Minor Victories is tallied. Note that there are two Major Victory conditions for Good and only 1 for Evil. The Cavalry Arrive! On the turn that the cavalry arrive on the main board, Good gets priority automatically. 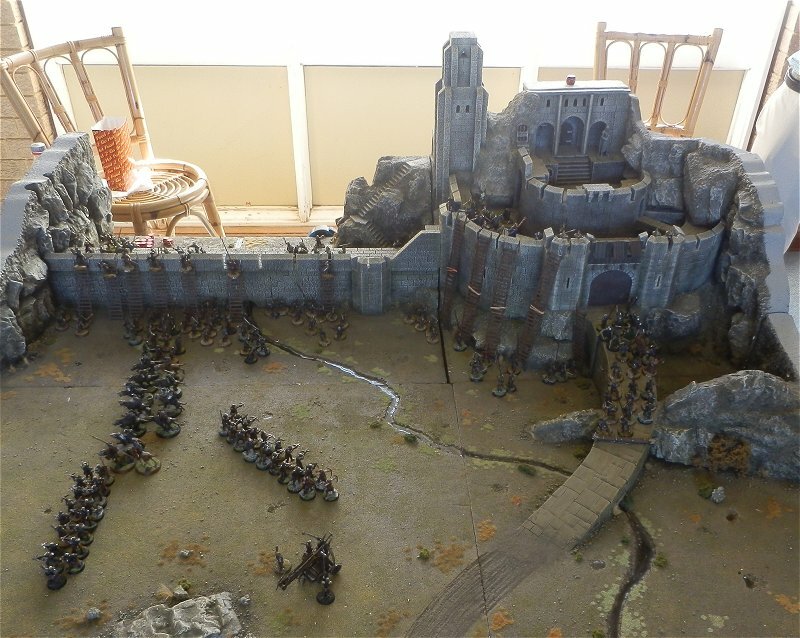 Secret Gate: The Cavalry may enter Helms Deep by a secret gate at any point along the wall chosen by the player. Murder Holes: Thrown weapons are harder to dodge and have +1 to hit when thrown through a Murder Hole above the gate. My thanks to Matt, Mike, Julian, Connor, Aaron & Gage for a great game and thanks again Matt for writing this report. 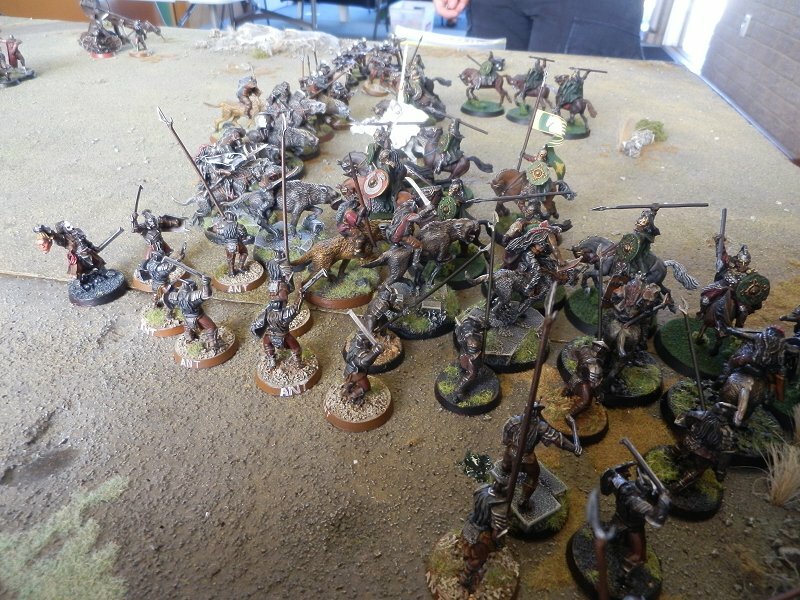 A 1 day campaign for LotR SBG. 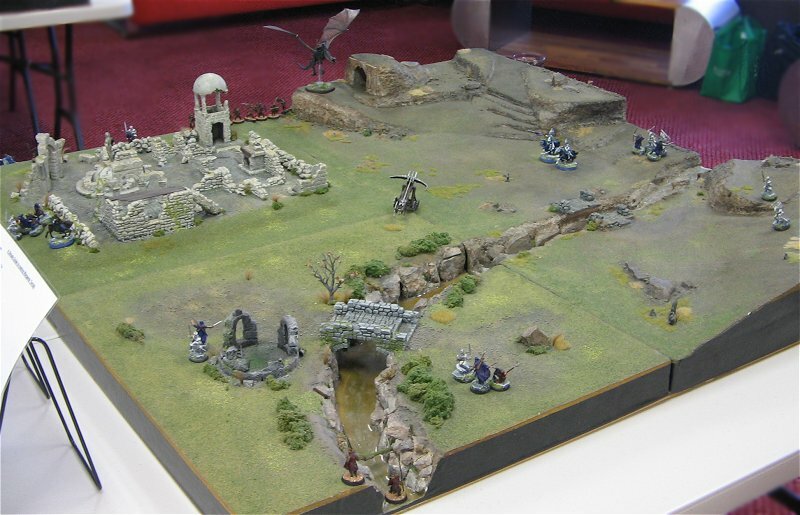 Blood and Sand was a fantastic one day event organised and run by Matt and the Tabletop Gamers Association. It was a real thrill to see a lot of the terrain I’ve made for the local community being used during this event. 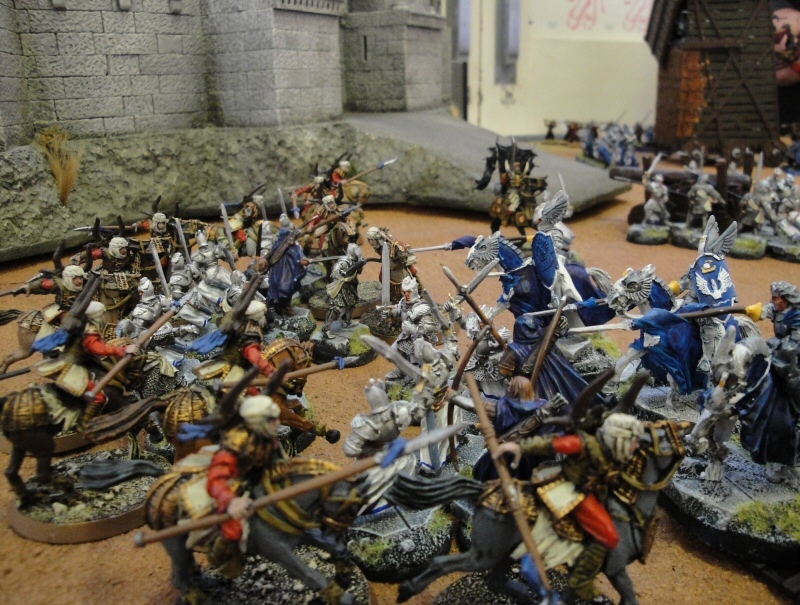 Also, all the armies were painted well and this just added to the visual appeal of all the games. Now, I didn’t win a game on the day but I had so much fun and I really recaptured my enjoyment of all things Lord of the Rings. Many thanks to Matt and TGA for putting on a great day. A few photos of the 10 games played. 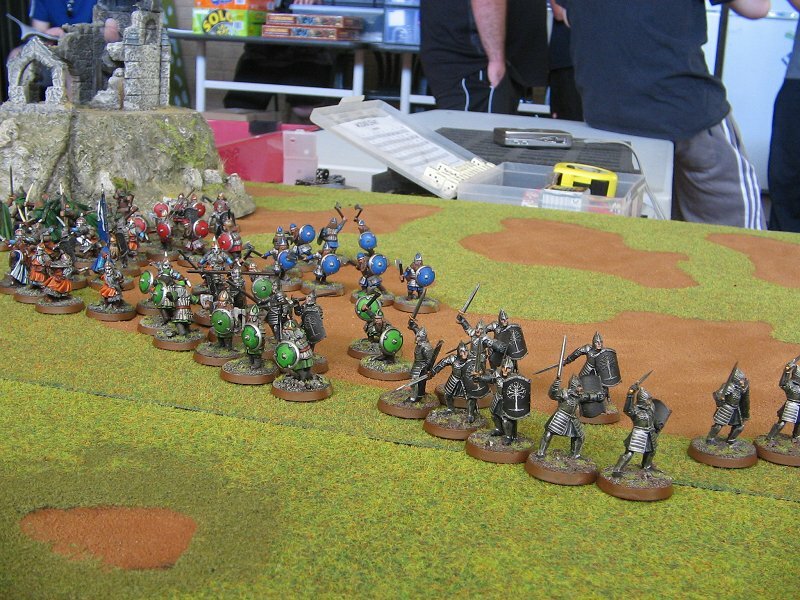 Feat of Arms was a fantasy board/war game conventionheld in Perth Oct 2010. 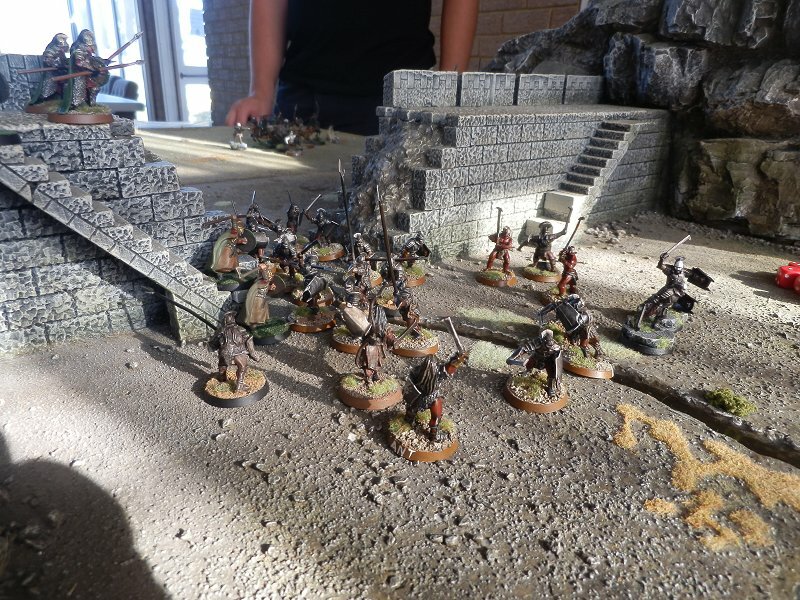 I was able to display my Helm’s Deep borad there and run a demonstration game of Lord of the Rings – Strategy Battle Game (with Matt_Shadowlord). The 3 stone Trolls were from Thomarillion. These are some photos from another 1 day campaign that was played in Perth, Nov 2010.